You can not only export movies, music, Camera Roll, etc. from iPhone to Mac, but also import local files to iPhone with help of AnyMP4 iPhone Transfer for Mac. Besides, you are able to convert both DVD and video files to iPhone compatible video/audio formats. 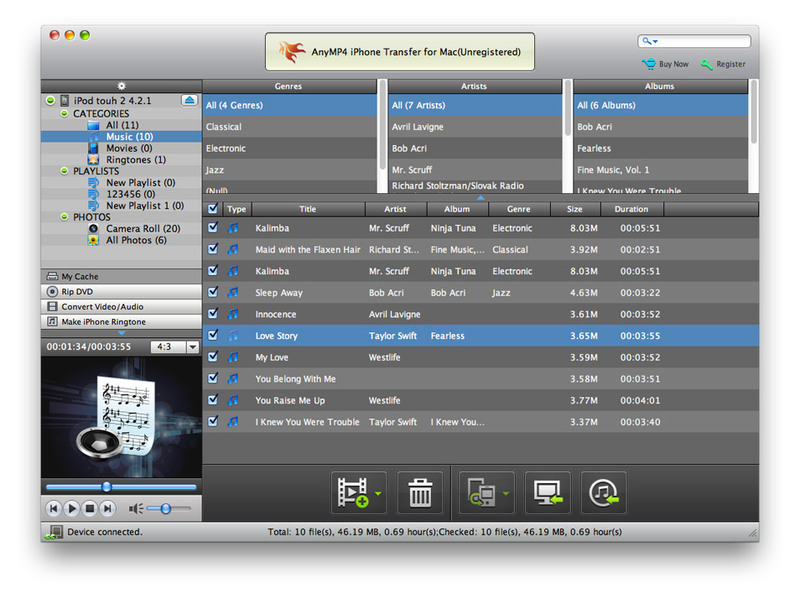 And users can choose their liked audio track and subtitle according to their needs with this software. Besides, this iPhone Transfer is highly compatible with all versions of iPad, iPhone and iPod. Also it can convert DVD and videos to your needed format for playing on the device as iPhone 5S/5C, iPad 4, iPod touch with perfect quality and high speed. AnyMP4 iPhone Transfer for Mac enables users transfer iPhone files including music, movie, pictures, Camera Roll and ringtone to Mac with fast speed. Also it can help users conveniently transfer music, video and picture from Mac to iPhone. At the same time, you can transfer files from iPhone to other iPhone devices and even iPod and iPad. This iPhone Transfer for Mac allows you to rip DVD and convert local videos to iPhone supported video formats like MP4, MOV, M4V, etc. on Mac. Also, you can extract audios from any DVD and video. With this software, after you convert the videos, you can also change the output effect. And it provides four kinds of languages to choose. Besides, you are able to choose your favorite audio track and subtitle by your needs and you can merge many video clips into one. AnyMP4 iPhone Transfer for Mac allows you to handle it easily because of the clear interface, the fast transferring speed. Only a few clicks can you finish the whole transferring process. Also, it can update automatically when update is available and preview the effect of source file clearly and easily.